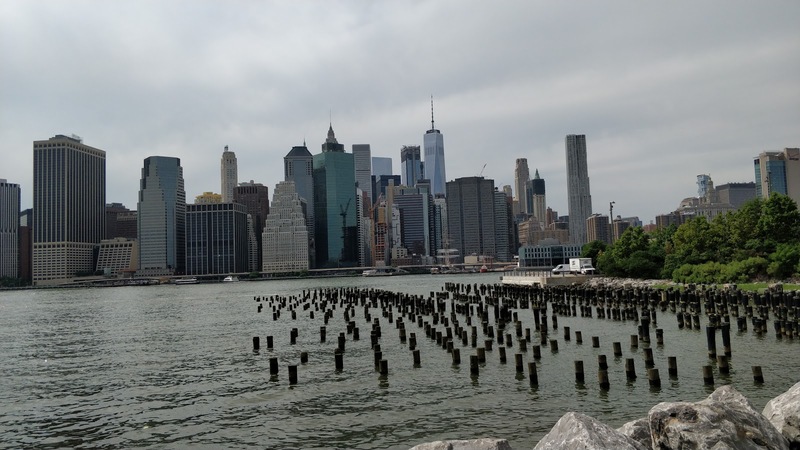 After a morning spent running around the neighborhood immediately around the hotel to ensure we had a place to safely park the car, we were finally ready to depart, though our first stop was actually deeper into Brooklyn. 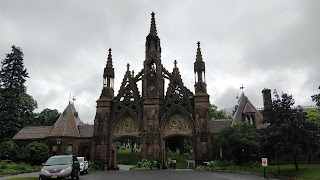 A friend had recommended Greenwood cemetery, which was a historic burial site dating back to the colonial days of American history. 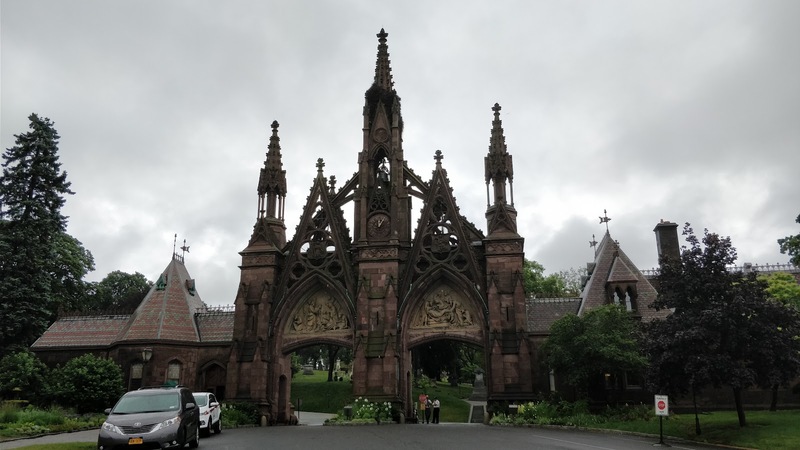 Crossing through the Gothic gates and driving through the winding labyrinthine paths dotted with historic sculptures and imposing mausoleums, the damp weather seemed to impart and equally somber mood to the place. On a sunny day, I can imagine strolling through the rolling grounds and enjoying the quiet oasis away from the hustle and bustle of the city, but today it just felt brooding and heavy. We departed the cemetery and stopped for a quick and tasty lunch in the nearby Sunset Park neighborhood before setting out to begin our drive out of the city. As expected, traffic was heavy, although we were moving pretty steadily given that this was just after noon on a Friday. 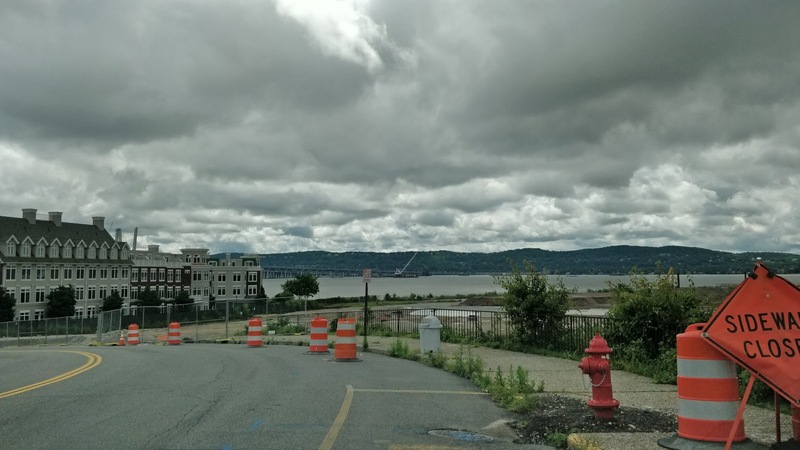 It took less than an hour to clear the outer boroughs and for us to find ourselves plodding along the highway with the music flowing, the scenery outside whizzing by. 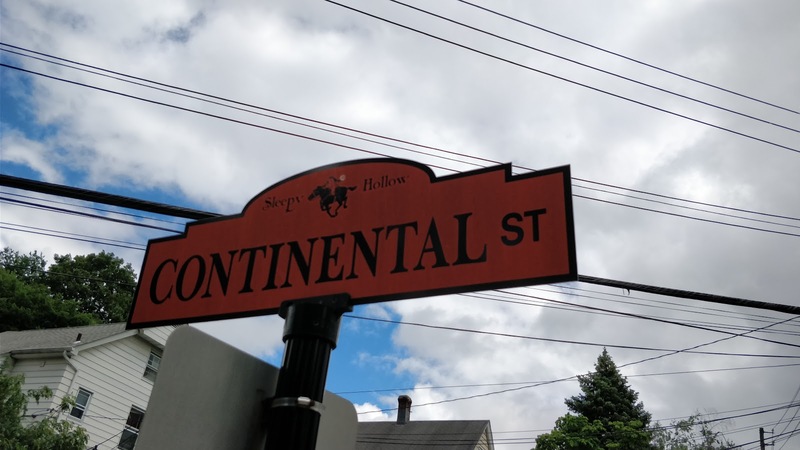 Prior to departing, I had requested that we make a brief detour to the town of Sleepy Hollow. Yes, that Sleepy Hollow, where the legend of the headless horseman is supposedly based. This was about checking off an item from my travel destinations list more than anything else, but it is always interesting to stop in small towns in the US to see what they are about. Time spent here was definitely less than 30 minutes, but just allowing me to check an item off my list meant it was satisfactory for me. Back on the road, traffic was light and we managed to make it to Germantown, a tiny hamlet in the heart of the Hudson Valley, by late afternoon. Our accommodations were at the Central House Hotel Inn, a large home converted into a bed-and-breakfast located at the heart of Germantown, right next to the local liquor store and across the street from the local market. Quaint might be even too much to describe this sleepy collection of buildings as we were probably the closest thing to excitement for the area this entire weekend. 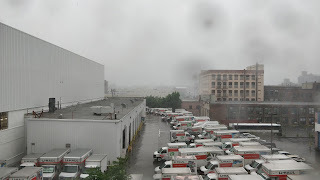 Settled into our room, we took the A4 and went in search of some ice cream as the rains in NYC had given way to bright sunshine and stifling humidity. Once the remainder of our group arrived, we gathered and decamped to the rehearsal reception for the wedding that was the reason we had traveled here from all over the world. 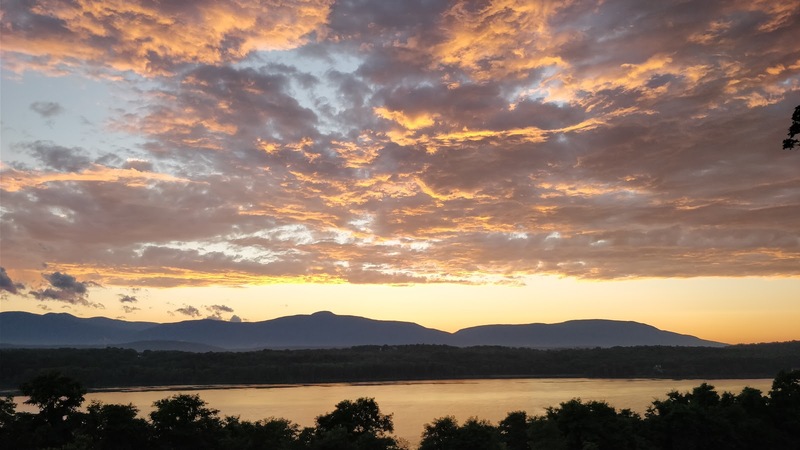 Located at the historic Southwood Estate along the banks of the Hudson River, the reception at the estate's pool treated us to spectacular views of the river as well as the Catskill Mountains on the far bank. As the sun set, we were treated to a brilliant display of light dancing through the clouds and across the peaks of the mountains, creating conditions that made for stunning photography. The beauty of the location was not lost on a single person present as everyone paused at some point to simply stare out at the river to admire the stunning views. Unfortunately, the weather that we thought we had left behind in the city seemed to have followed us at shortly after the sun ducked behind the peak of the mountains, the first furtive raindrops were felt, sending everyone not heading to their cars to seek out shelter on the porch of the estate house. 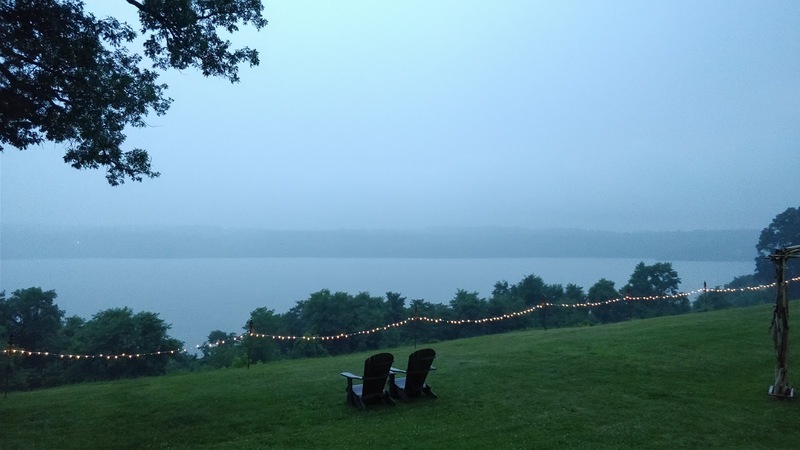 Those early drops soon turned into a torrential downpour as the skies opened up, lightning crackling in the distance, punctuated by claps of thunder that echoed off the walls of the home. A bunch of us hung out there on the porch for quite a while, enjoying the cooling breeze that swept away the humidity while the rain kept the bugs at bay. Following a late night that involved quite a bit of drinking and some truly deep conversations aimed at resolving the inequities of the world, we were awoken too early by the piercing light of the morning sun forcing its way through our room's east-facing windows. It wasn't long before I gave up the fight and crawled out of bed to grab some breakfast. Over breakfast, the idea to seek out apple cider donuts, a New England specialty, was bandied about and I volunteered to serve as driver for the mission. One of my compatriots joined me on the quest as we bounced around the local towns in search of the elusive little golden rings of cinnamon-sugary goodness, pushing the A4 hard through the twisty backroads. It took a few tries, but we finally succeeded in our quest and returned triumphant, just in time to grab lunch with the group before spending the remainder of our day in celebration of our friend's wedding. 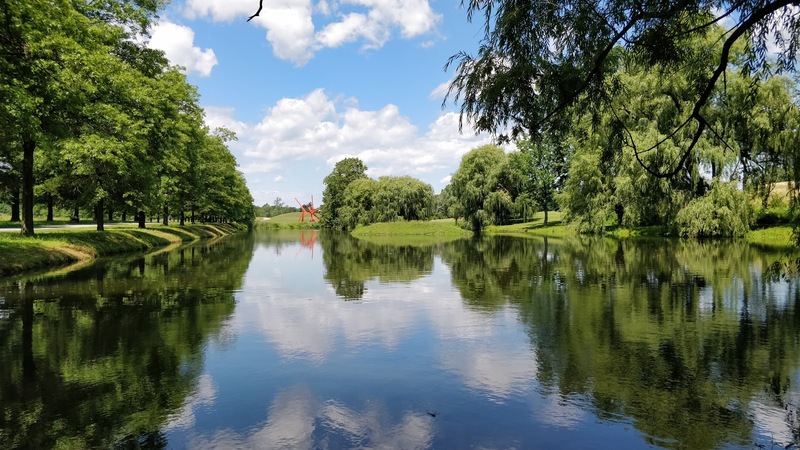 Sunday brought beautiful skies and milder conditions as the rains from the night before had alleviated much of the humidity. We enjoyed brunch over at the estate, one final opportunity to see friends and the bride and groom before parting ways until the next wedding can bring us back together. 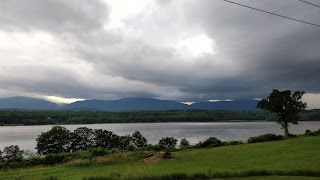 Soaking in our final views of the Hudson, we load up the car and get back out on the road. 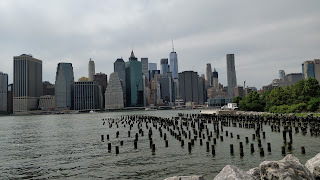 Taking a slightly different path back towards Manhattan, we had one more stop before we needed to turn the car in. 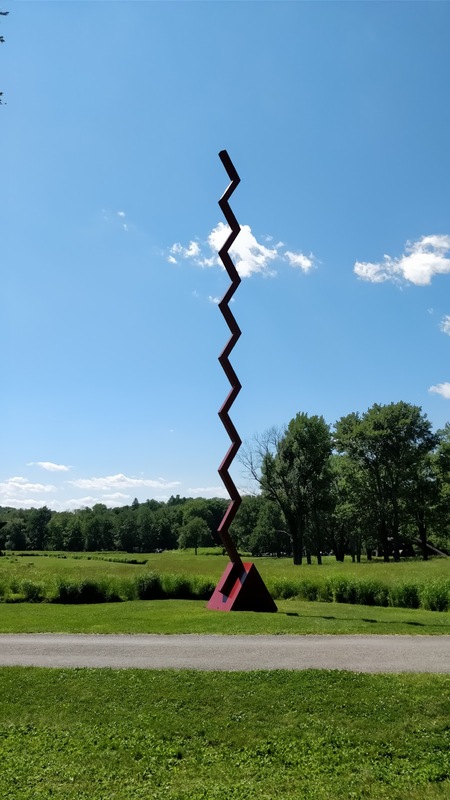 If you have seen the latest season of the Netflix Original, Master of None, you may recall a scene where Dev (played by Aziz Ansari) and Francesca (played by Alessandra Mastronardi) have a moment overlooking the stunning sun-drenched grounds of the Storm King Art Center. Before even leaving for New York, we had done a little research and incorporated it into our plans to visit the center during our trip. 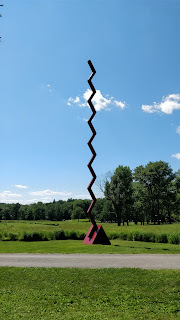 Since Storm King is conveniently located between the Hudson Valley and NYC, we knew that planning a slight detour would give us at least an hour or two on the site. Wending our way through the back roads of NY, we are finally able to grab a space at the lower lot in Storm King. We had hoped to grab a couple of the bikes they had for rent, but they were all out so we settled for traipsing about by foot. 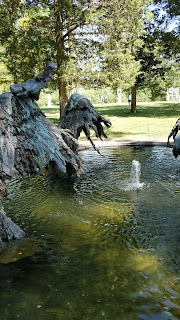 Wandering the extensive grounds, we sought out specific notable displays, stopping at others that happened to cross our paths. 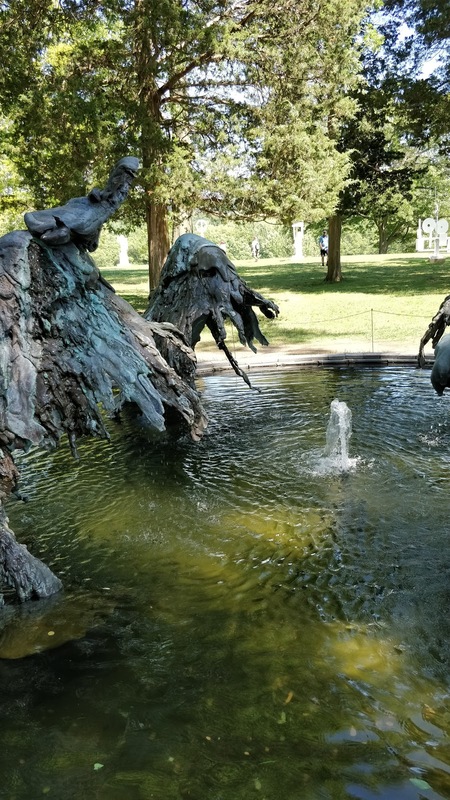 At a steady pace, we were able to see many of the better known pieces, but were not able to spend any time viewing the special exhibit in the main manor house. Even so, the majesty of the location is hard to ignore. Take Maya Lin's Wavefield, a stunning execution of the waveform using dirt and grass on an 11-acre site. Have you ever wondered what it would be like to walk on the crest of a wave as it came ashore? This piece offers an opportunity to explore that very idea. 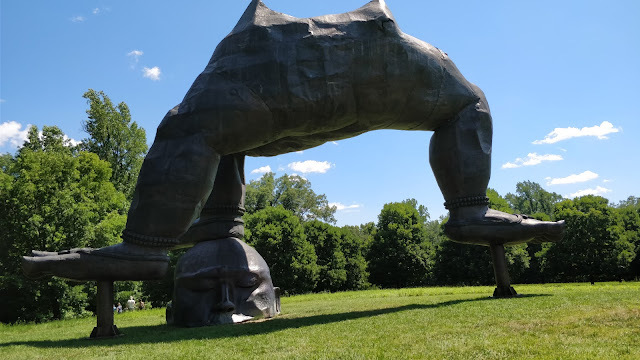 Or how about Zhang Huan's Three-legged Buddha, a unique take on religious iconography that literally stands tradition on its head. 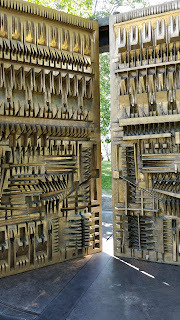 The sheer bulk of the piece juxtaposed with the lightness of being suspended on a few small, but stout, pillars. It is an illusory effect that really takes a moment to fully appreciate. 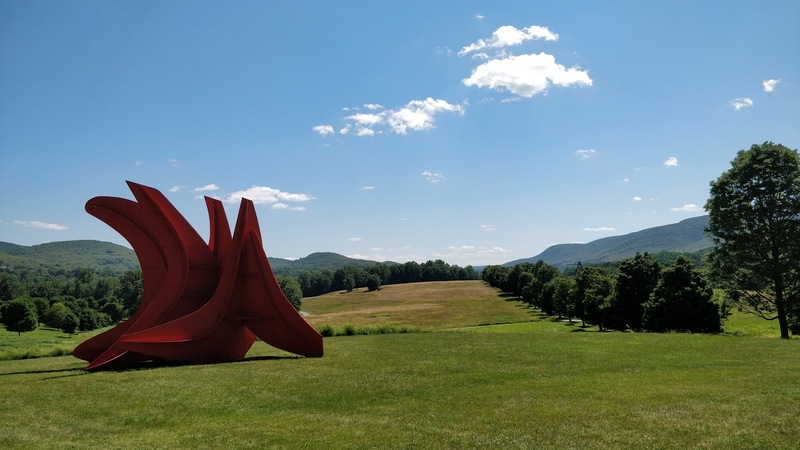 Also on display are several pieces by famed sculptor, Alexander Calder, including Five Swords, a flowing work of organic looking forms made from metal and drenched in a brilliant red-orange paint that contrasts against the subtle rolling green hills and groves of trees of the property. 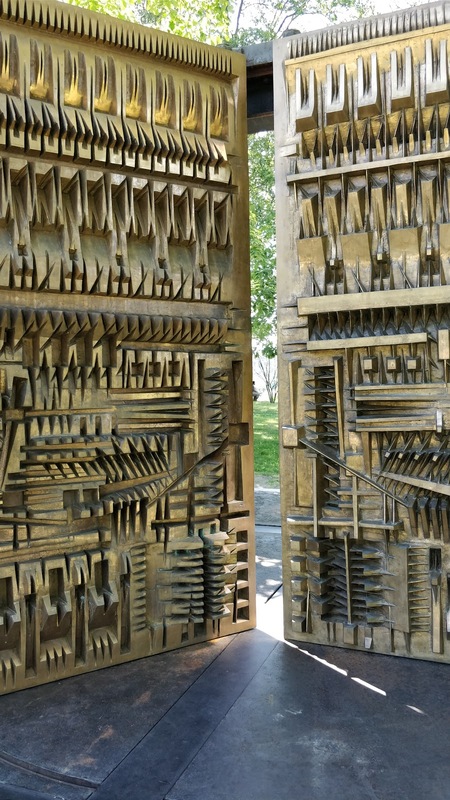 And that is only a tiny sampling of the dozens upon dozens of works of art that are on display. If we had had more time, we could have easily spent hours roaming the fields of the vast property and studying each work much more closely. Alas, our time was limited and we needed to race back to NYC before time ran out on our rental. 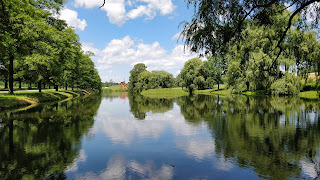 We hiked our loop around the grounds and tried to take in as much as we could, but knew full well that our next trip to NYC would likely include another trek out to these grounds, hopefully with a full day to spend on the property to explore. 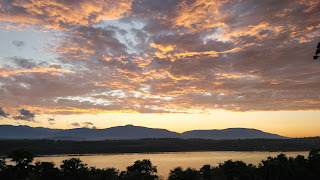 As we got back in the car and resumed our journey, making rapid progress towards NYC and the setting sun, I am reminded of our trip across the US nearly three years ago. 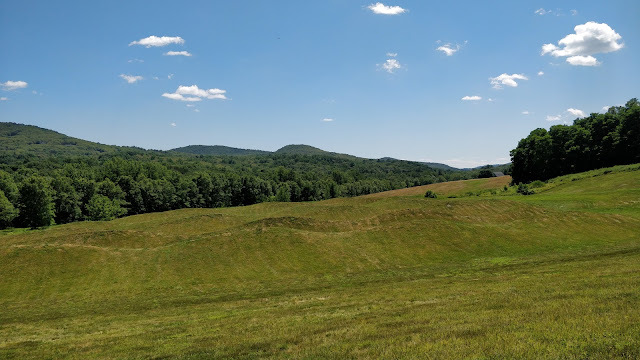 My wife and I got to see parts of the country we had never visited, including the Finger Lakes region of upstate New York, Nashville, St. Louis, and Atlanta, all of which we toured by bike. This country has so much beauty to offer that we should never allow it to be clouded by hatred and bigotry. We need to explore and understand the diversity that gives the US so much of its culture and character and embrace that as a means to make it stronger. It does not require traveling across the country to do that exploration, in many cities there are entire neighborhoods with massive cultural diversity that are worth exploring and everyone should seek out those opportunities whenever they can.